> Ban nanoparticles in organic products? One of the most pressing concerns we face today is the sustainability of the world’s natural resources. Forests, for example, generate a wealth of ecological benefits: they store moisture, they are a valuable source of food, they contribute to soil stability and they absorb CO2. This is why the use of forest resources and their products, such as wood and paper, has become a pressing environmental issue. Several documents have been published recently which examine this issue from a number of perspectives. The WWF Guide to Buying Paper begins by listing the significant contribution which paper has made to our cultural development, as well as to the spread of literacy and even democracy across the globe. Moreover, paper is produced from a renewable resource. However, the 1 million tonnes of paper consumed around the world every day poses a threat not only to the flora and fauna of natural forests, but also to the people whose existence depends on them. In addition, the paper industry is one of the largest greenhouse gas emitters, a heavy consumer of water and energy, and a producer of significant amounts of pollutants. The guide describes possible solutions like the use of certified resources and the development of initiatives with companies. For example, Deutsche Bahn is issuing its train tickets exclusively on FSC certified paper. Finally, the WWF Paper Scorecard rates paper manufacturers according to their environmental performance and the environmental footprint of their paper products. It also enables a comparison of manufacturers’ scores. In turn, this information could help purchasers and consumers decide on what product to go for. The Guide to the Sustainable Procurement of Wood and Paper-based Products is aimed primarily at those firms and purchasers of paper, timber and wood-based products who lack the necessary in-house forestry expertise. The information in the guide is organised around the legal, environmental and social aspects of ten key sustainable procurement questions. Besides the legality of production and the problem of climate change, the guide raises two particularly interesting points on the appropriate use of recycled fibres and other resources. For example, the use of recycled fibre is a significant complement to the use of virgin fibre. Also, other non-wood fibres, such as hemp and straw, can be used to make paper. One path which could be explored is the inclusion of as much recycled material as possible and the promotion of measures to help the collection of recycled fibres in sufficient amounts to meet demand. At the end of the article, a summary list of various sustainable procurement initiatives is given. These are broken down according to the parts of the supply chain affected by these initiatives, their geographical scope and the ten key areas mentioned earlier. The table also includes a description of the objectives of these initiatives as well as the relevant contact details. On a much smaller scale, the manufacture of Lokta (Daphne spp.) 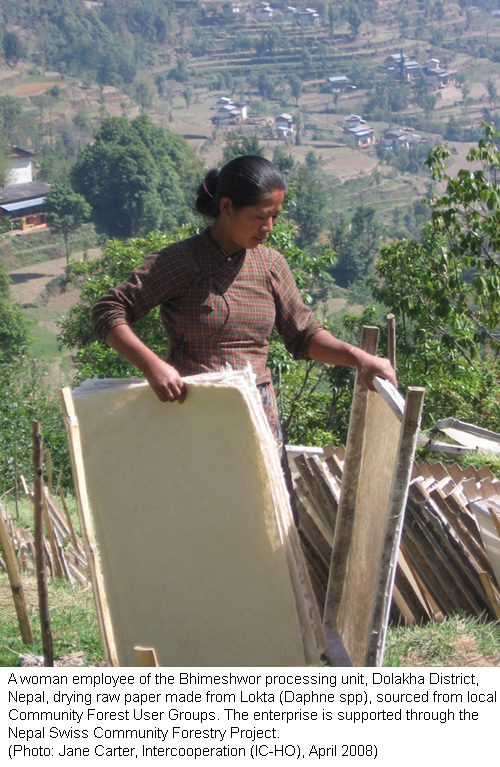 paper in Nepal meets a number of the sustainability criteria mentioned earlier. The entire paper production, carried out by hand, is reflecting a value chain from its start to finish. Until 1959, it was compulsory for the Nepalese government to produce all legal correspondence on Lokta paper. It was also in great demand among the country’s Buddhist monks. 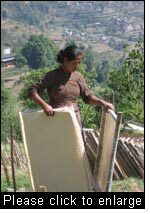 In more recent years, this handmade paper has become greatly prized by tourists and the urban Nepalese population. Today, close to 4,000 families are employed in the rural paper-making industry. Lokta paper is made from the inner bark of the eponymous wild shrub. Naturally occurring in most conifer forests in Nepal, the lokta has a growth cycle of 5 to 6 years. Around 110,500 tonnes of raw lokta are available in Nepal, of which only an estimated 800 to 1,000 tonnes are extracted annually. These three articles provide consumers and purchasers alike with a few ideas they could adopt that would help curb the destruction of forests, combat climate change, and reduce waste. > Sustainable Procurement of Wood and Paper-based Products: An introduction. World Resources Institute, End 2007. 15 p.
> Sustainable Procurement of Wood and Paper-based Products: Guide and resource kit. World Resources Institute, March 2008. 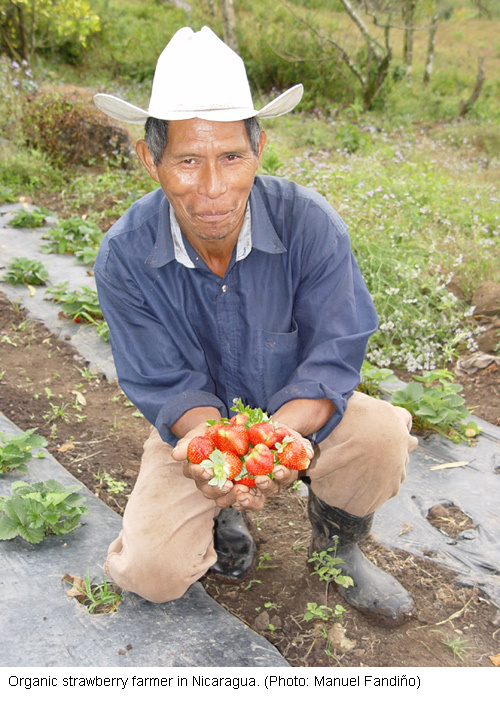 142 p.
Nicaragua has seen a vigorous development of organic farming over the past 25 years. Today, due particularly to initiatives of NGOs and producers’ organisations, over 6600 farmers are cultivating around 70,000 hectares of cropland according to organic standards. Their most important products are coffee, sesame, coconut, honey, and cocoa. All of these are mainly produced for export. The international demand for organic food remains high. Nicaragua has sufficient suitable cropland, farmers with a traditional background of organic cultivation practices, and a political environment with a relatively positive attitude towards organic farming. In a policy paper, representatives of the organic farming sector suggest a variety of measures to ensure that these favourable factors are put to work for further successful growth of the sector. Recommended measures include building institutional capacities for efficient promotion, control and organisation of the sector, as well as enhancing technological know-how with regard to production and processing. Better information and lower costs for state certification are put forward as measures to facilitate access to export markets and, at the same time, foster local market development. Finally, the authors suggest that the government encourage transition to organic farming through incentives such as tax reductions, payment for environmental services, and guarantees on prices. Source: Propuesta política para el fomento de la agricultura orgánica en Nicaragua. Borrador propuesto para discusión de parte del sector orgánico nicaragüense. Managua, Febrero 2008. 28 p.
In a largely – but not exclusively – U.S.-related context, the WRI has been observing new dynamics in the arena of environmental politics, where climate change is the uncontested driver of events. The private sector has become more active and is pressuring for political solutions; in this respect, Europe is on the advance, while decision-making processes are slowed in the U.S. due to the presidential elections. China, on its way to becoming the greatest polluter, is increasingly facing international pressure for a more climate-friendly policy, mainly from its trade partners. Moreover, the author observes a marked rise in investments in new, clean technologies, including technologies for producing second-generation biofuels, e.g. from cellulose or waste products, to counteract the negative impacts of current biofuel production on the environment and on food security. At the same time, solar technology is becoming economically competitive, and the development of new possibilities for carbon capture and storage has begun to take shape. Source: Environmental stories to watch in 2008. Remarks by Jonathan Lash on December 18, 2007 at the National Press Club Briefing for Journalists. World Resources Institute. 2008. 17 p.
One frequent consequence of favourable taxation for oil exploration is the shrinkage of forest land. It is clear, therefore, that the policies adopted by those sectors which use forest products and lands have a direct impact on the forests themselves. Based on a matrix which includes the various sectors and the tools available to them, the “toolkit” puts forward a number of ideas which could help reduce the effect of cross-sectoral action on forest biodiversity. One of the case studies included in this publication is Costa Rica, which has rich biodiversity and forest reserves. In 1992, the country introduced an economic incentive system to preserve these resources and to promote their sustainable use. The system compensates forest owners for environmental services they provide, such as leisure and welfare activities, watershed protection and greenhouse gas reduction. The most common biodiversity preservation tools are codes of conduct, compensation schemes and facilitating the market access of local populations. The final section of the article contains an annotated bibliography of recent publications covering a large geographical range. Source: Cross-Sectoral Toolkit for the Conservation and Sustainable Management of Forest Biodiversity. I. Thompson and T. Christophersen (Eds.). Secretariat of the CBD. 2008. 53 p.
Ban nanoparticles in organic products? Nanotechnology deals with matter on a very small scale and has a vast range of applications. One of them is the use of nanoparticles – particles ranging from 1 to 100 nm in size (1 nm = 1 billionth of a meter). Several uses of nanoparticles are related to organic farming, for example as additions to food, in pesticides, or in packaging. Many applications have a high potential, but they also imply great uncertainties and risks. Until now, there is neither a commonly recognised definition nor any statutory regulation of nanoparticles. The organic sector still has to agree on whether they should be banned or permitted, and under which circumstances. The scarce preliminary research conducted so far has suggested negative effects on living organisms. The UK’s main certifying body for organic products, Soil Association, is following the precautionary principle. As of January 2008 it is banning the use of nanoparticles from all organic products it certifies (particularly health and beauty products). The Swiss Research Institute of Organic Agriculture (FiBL) calls for declaration of any use of nanoparticles until scientific data will have clarified their effect on humans and the environment. Nevertheless, FiBL advocates the opinion that the lack of data should not be taken as a reason to generally ban all uses of nanoparticle technology. According to FiBL, risks and benefits may vary greatly depending on the application, which is why each situation should be assessed individually. > Soil Association first organisation in the world to ban nanoparticles – potentially toxic beauty products that get right under your skin. SA Press Release 01/17/2008. Investing in education means investing in the future. This statement is particularly topical and relevant with respect to agriculture in developing countries. However, agricultural education systems in many countries of the South are in need of reform. They often lack the resources and know-how necessary to prepare students in an adequate manner for the numerous new challenges facing agriculture worldwide. The Swiss College of Agriculture (SHL) will be offering a new master’s programme in Applied Agriculture and Forestry as of September 2008. Students will be able to specialise in one of three subject areas: Management of Value Chains (economic approach), Sustainable Production Systems (technical-ecological approach), and Agriculture and Forestry in Transition (sociological approach). The programme addresses students with a bachelor’s degree in a related subject. The teaching language will be English, and students from abroad are particularly welcome to participate. However, they are responsible for their own funding, since SHL cannot offer any grants. The scientifically-based and practice-oriented master’s programme at SHL is designed to convey expert knowledge that is of great importance for successful rural development. In 2002, the World Bank recognised the need for an integrated approach to curb unsustainable forest practices and deforestation. By mid-2007 it had submitted its first draft proposal on a possible Global Forest Partnership (GFP) to a variety of international cooperation stakeholders concerned with forest-related issues, including government agencies, NGOs, indigenous groups, charitable foundations and the research community. During the second half of 2007, the International Institute for Environment and Development (IIED) assessed the World Bank proposal by means of surveys of stakeholder opinion, focus groups in seven countries as well as an online survey open to everyone. The IIED found that such a partnership could indeed be of great value but only if it were widely “owned”, i.e. other partners besides the World Bank were actively involved, and if it had close links to local realities. Survey respondents also considered that regardless of the type of global forest partnership, the World Bank should be responsible for the application of financial instruments. However, it should first boost its credibility by accepting to co-manage this initiative with third parties. The IIED assessment concluded that the key challenge will be finding institutions prepared to bring the GFP vision to fruition, in other words to develop a partnership which responds to global, national and local needs. For a long time it was assumed that small-scale extraction of non-timber forest products has little to no influence on the stability of ecosystems. On the contrary, it was considered beneficial for forest conservation and as an additional source of income for poor households. However, long-term observations have failed to corroborate this theory, in fact revealing negative effects on the biodiversity and the resilience of the ecosystems. This is one example among others that clearly underlines the importance of ecological monitoring in defining the boundaries between sustainable and unsustainable management of nature. An approach developed by the Southern Alliance for Indigenous Resources (SAFIRE) operates on the community level and focuses on traditional knowledge. A participatory process encourages greater commitment among local actors; at the same time, the monitoring can also be conducted by external experts. Various options are considered and discussed, including, for example, involvement of scientific experts and use of modern technological methods such as geographical information systems. This method requires little financial input and is therefore suitable also for small-scale projects. Moreover, the present manual explains the different steps and recommendations in a way that allow for their application to different natural resources. Source: Community-based ecological monitoring – Manual for practitioners. Alexander Fröde and Christopher Masara. SAFIRE 2007. Posted on the Development Gateway Portal in March 2008. 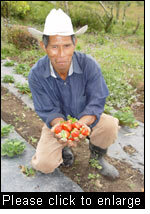 64 p.
Well before the onset of the hurricane season the Quenzungal in Honduras plant their crops. They plant them beneath trees, whose deep and broad root systems stabilise the soil so well that this cultivation method secured ninety percent of the expected yield even under the devastating impact of Hurricane Katrina in 2005. Countless other indigenous and traditional societies around the globe hold a wealth of knowledge about how to deal with “nature’s whims”. To date, this store of knowledge is poorly researched. Even less is known about how numerous ethnic groups living in regions prone to climatic risks cope with the increasingly severe impacts of climate change. An IUCN report published in March 2008 suggests several approaches to closing this gap. The authors identify cultural and social impacts of climate change on indigenous communities living in coastal regions, arid regions, tropical rainforests, and mountain regions. In addition, by means of numerous case studies the report provides valuable insights into a multitude of adaptation efforts that are already being made. How do traditional populations deal with habitats fragmented by forest fires, with loss of biodiversity, with increasing risks of flooding? The report is rounded off with a synthesis offering promising approaches for policy-making and project work. Since the 1990s, Vietnam’s transition from a planned to a market economy has led to rapid economic growth and better integration into the global market. Coffee production has been drastically expanded and has caused a considerable wave of migration from the lowlands to the central highlands. Based on two case studies, one of an in-migration region and one of an out-migration region, this article shows that the flow of migration has economic, ecological and social impacts on all populations involved. Coffee prices on the global market are volatile. At the same time, coffee production requires increased inputs in fertilisers and irrigation, leading to accelerated soil degradation. This, in turn, exposes all parties involved to increased risks to the sustainability of their livelihoods. Support for out-migrants from family members and social networks is an important strategy to counteract these risks. However, it transfers the risks to those left behind. At the same time, the migration dynamics between the two regions also affects the development of neighbouring regions (urbanisation, industry). Based on these insights, the author underlines the importance of taking into consideration the linkages between all regions and populations involved, as well as their coping strategies, when researching the impacts of globalisation on these mountain regions. Source: Rural In-migration and Global Trade. Managing the Risks of Coffee Farming in the Central Highlands of Vietnam. Alexandra Winkels. Mountain Research and Development, Vol 28, No 1, 2008. 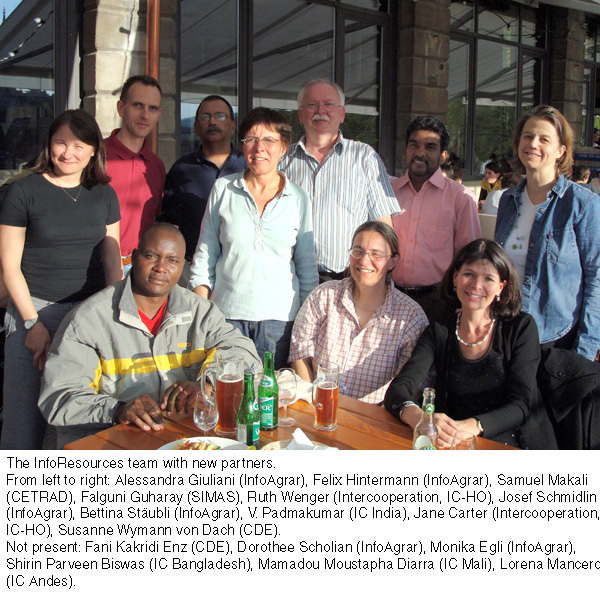 9 p.
As of January 2008, InfoResources is collaborating with new partners around the world. These partnerships are part of a general effort by the InfoResources network to promote developing country perspectives, and will enrich InfoResources products by directly including points of view of stakeholders in the South. Moreover, these partnerships broaden the InfoResources network of expertise. Based in Nicaragua, the Servicio de Información Mesoamericano sobre Agricultura Sostenible (SIMAS) specialises in information management. SIMAS collaborates with a broad network of farmers and civil society organisations in Central America. The Centre for Training and Integrated Research in ASAL Development (CETRAD) is situated in Kenya and focuses on the assessment and evaluation of the potentials and the use of resources in arid and semi-arid land (ASAL) areas. 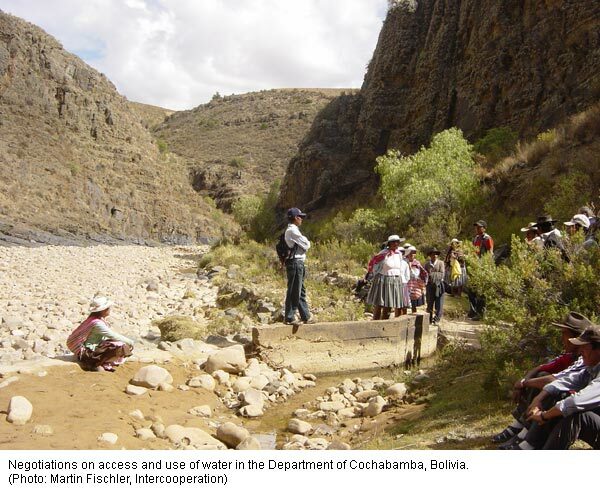 In addition, through Intercooperation (IC-HO), InfoResources collaborates closely with IC delegations in the Andes, Bangladesh, India, and Mali.